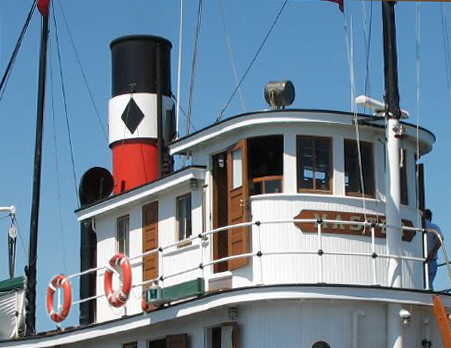 This steam powered tug is an amazing piece of maritime history … and she is almost 100 years old! 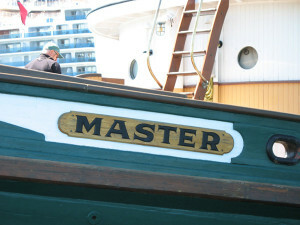 The Master is truly unique and stands out in today’s world of steel hulled, diesel powered tugs. 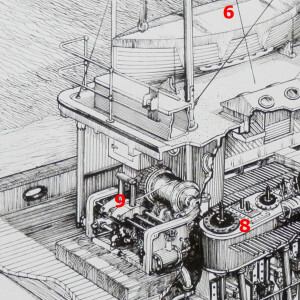 Her power comes from a British Navy surplus Triple Expansion Steam engine built in 1916. 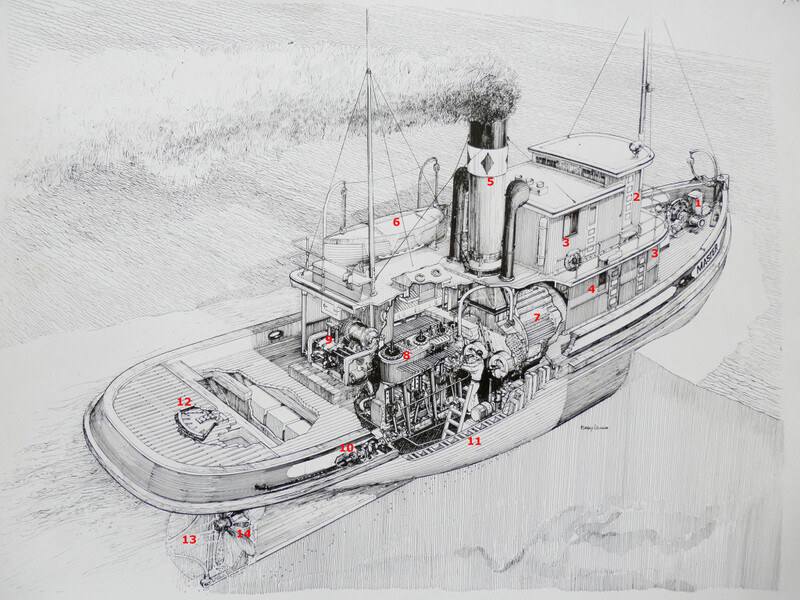 The steam engine, boiler and ships steam systems are cradled in a massively strong double wood hull. 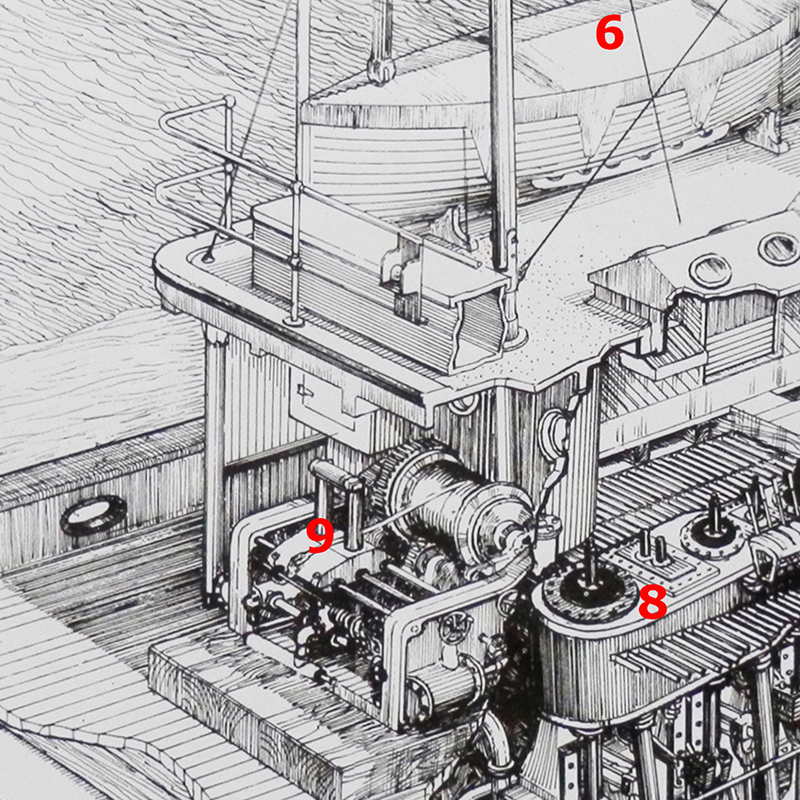 The steam anchor winch (1) is located at the bow of the ship. 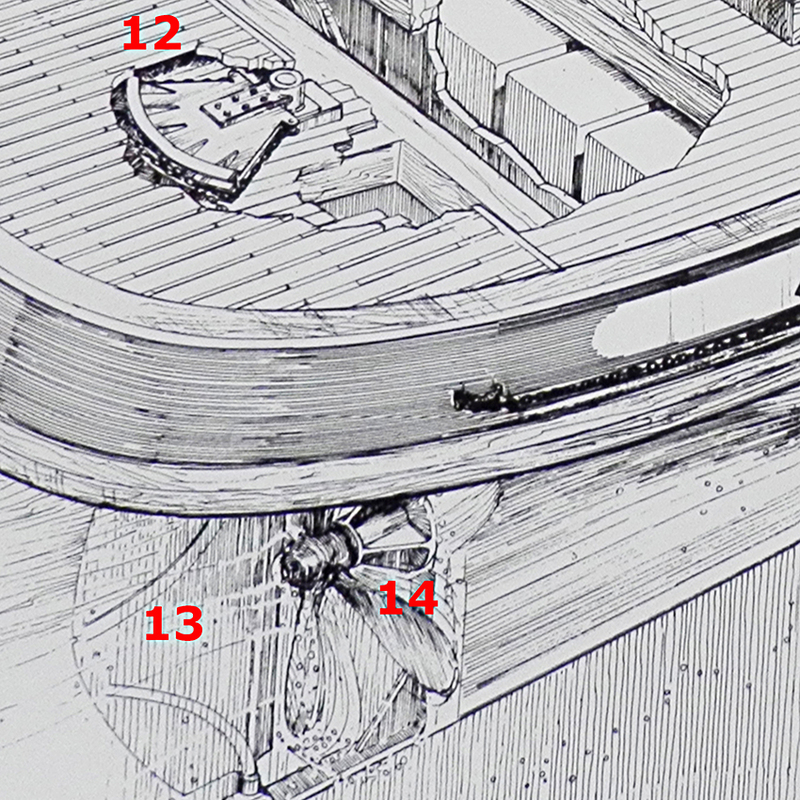 There are four crew births located below deck as well as one crew cabin 3), starboard side on the main deck. 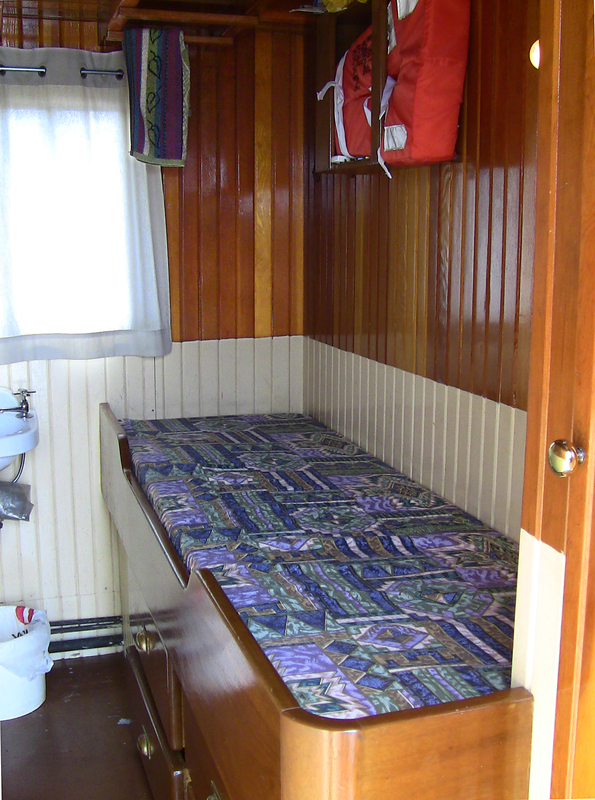 The galley (4) is just aft of the crew cabin. 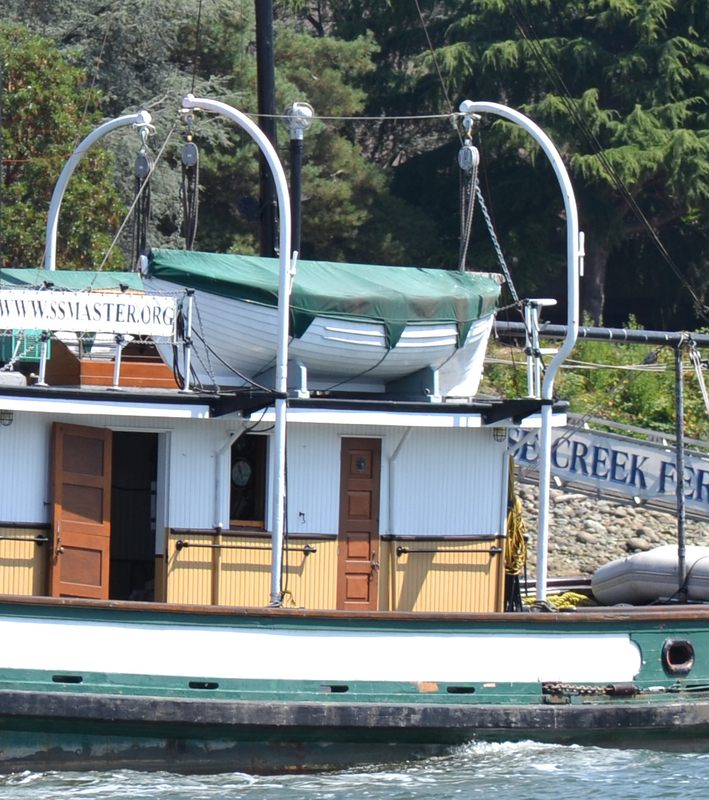 The wheel house and captain’s quarters (2) and first mate’s cabin (3) are on the top deck. When working, she carried a crew of seven, 3 Engine Room Crew, 2 Deck Hands and a Captain & 1st Mate, however She has bunks for nine. 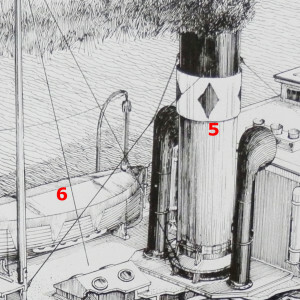 The massive smoke stack (5) is located aft of the crew cabins on the upper deck. 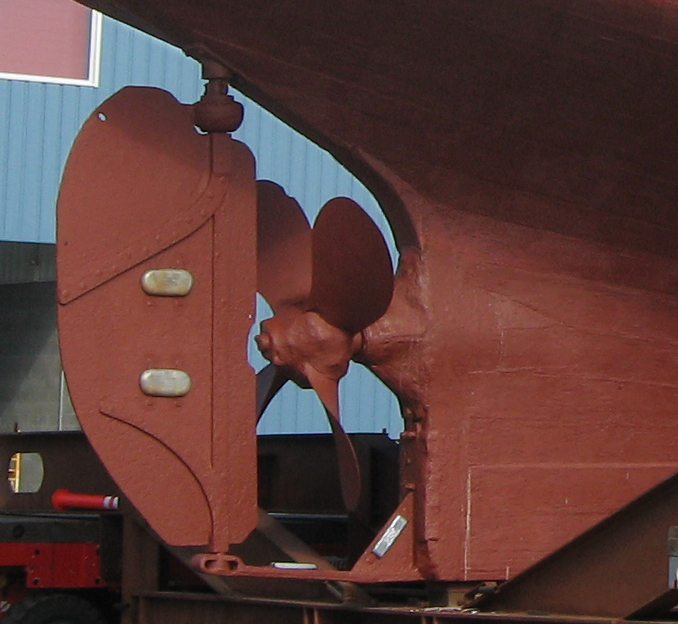 Large are air scoops on either side of the stack provide combustion air required for the huge 10 ton boiler below the main deck. 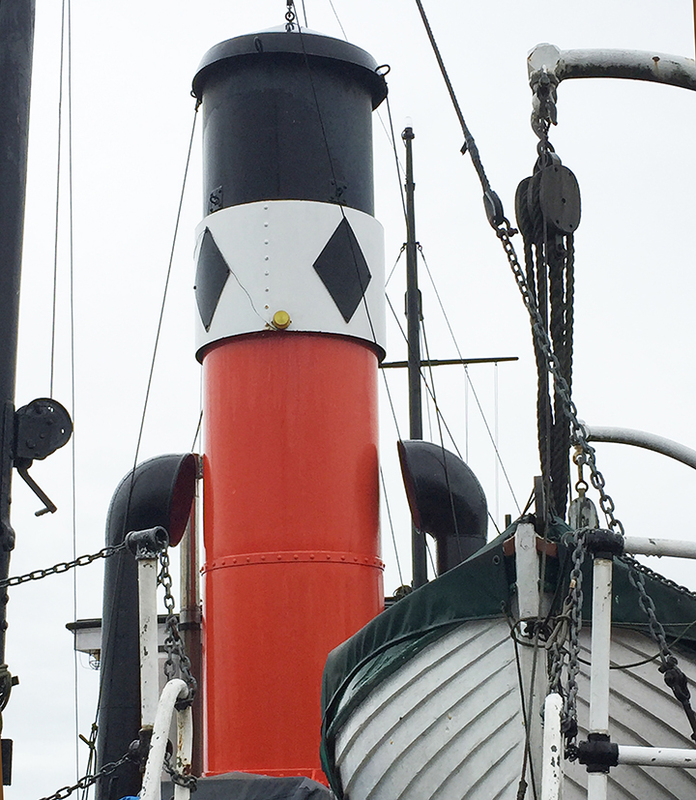 Two life boats (6), one starboard and one port side, are hung on davits, mounted on the top deck. The Master spent her entire active life on the west coast as a tug boat. 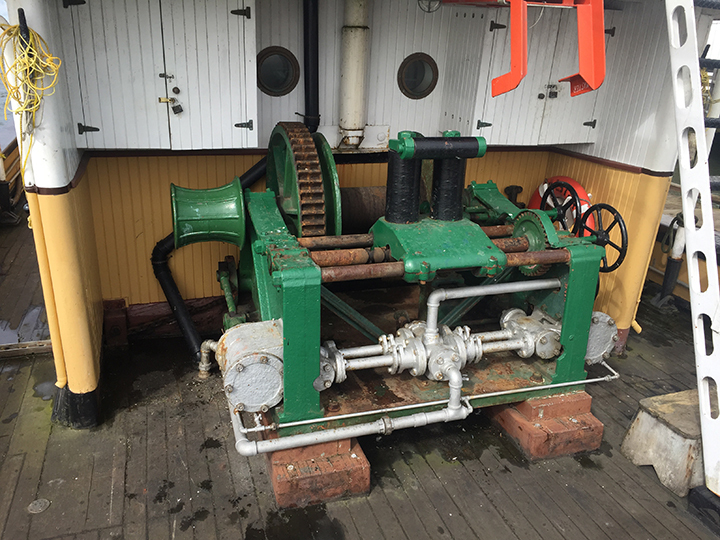 Her steam powered towing winch (9) is mounted on the ship’s centre line on the aft section of the main deck. 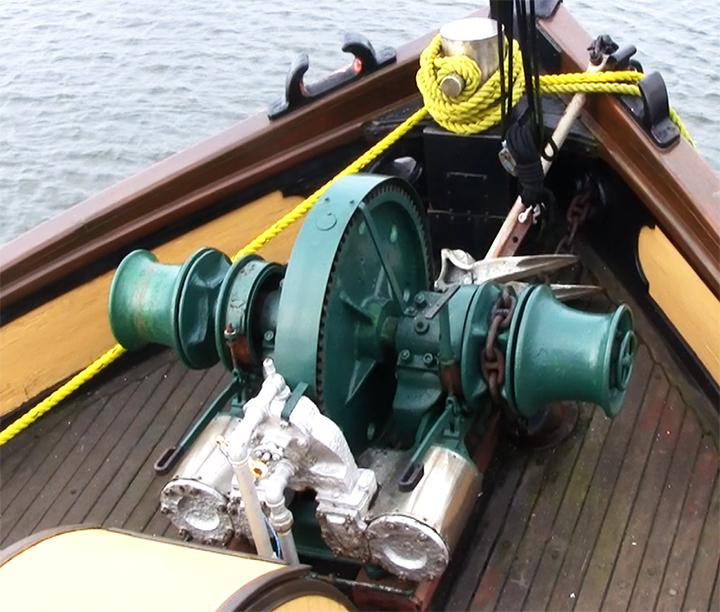 Hundred’s of feet of steel cable were spooled on the winch and used to pull barges and log booms. 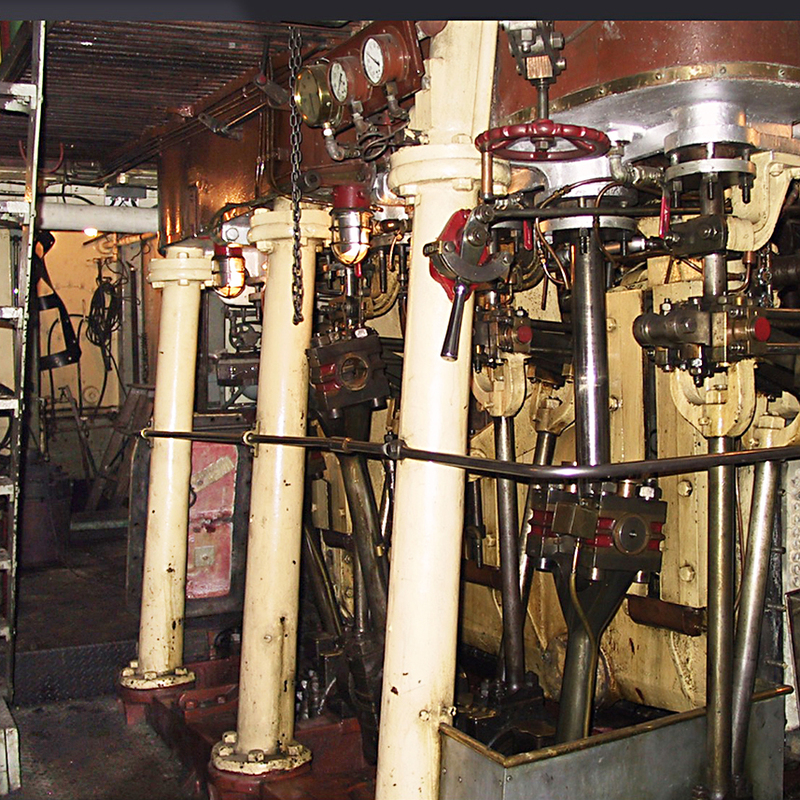 The heart of the ship is the triple expansion steam engine (8) which was made in 1916 in the UK. 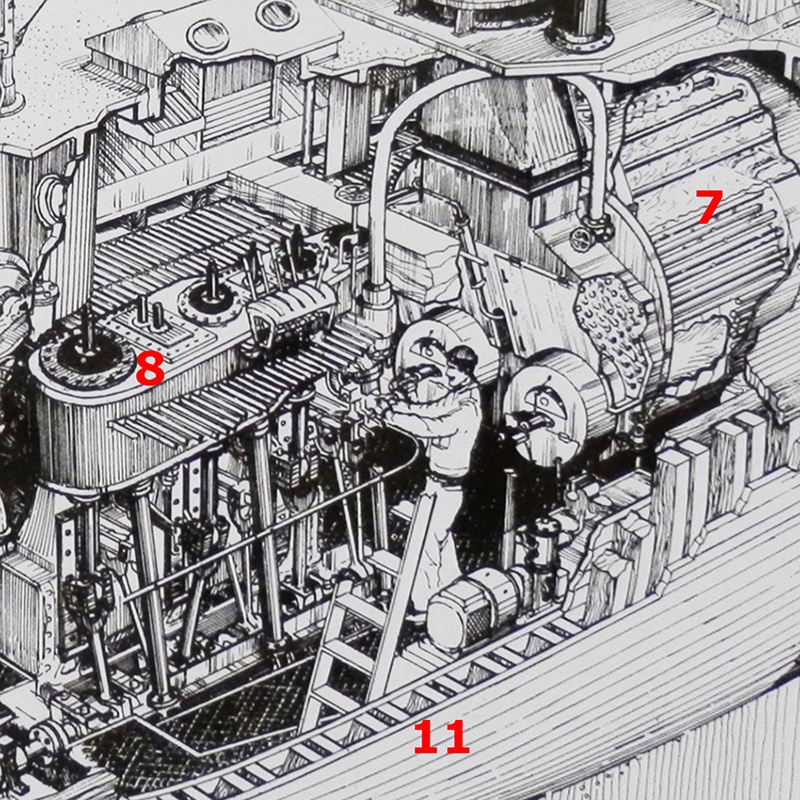 Steam for the engine is produced in the 10 ton Scotch Boiler (7). 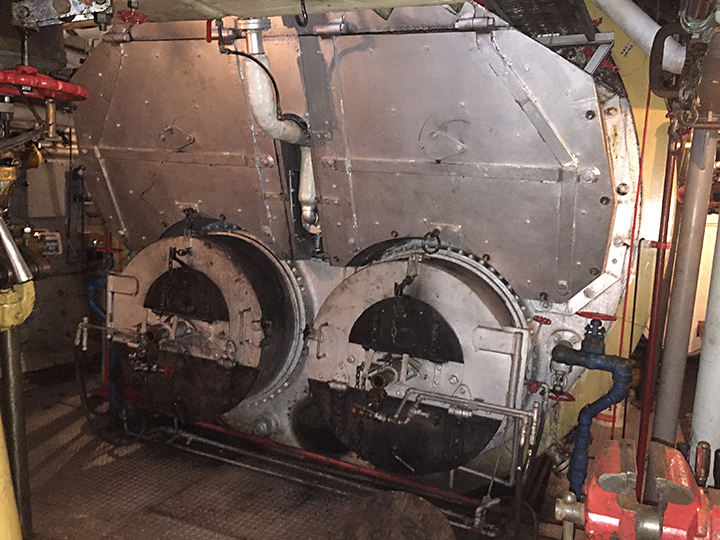 Two burners provide heat to generate steam and the burners can use diesel fuel or bunker oil. 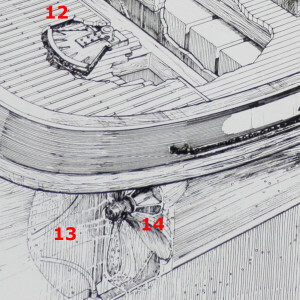 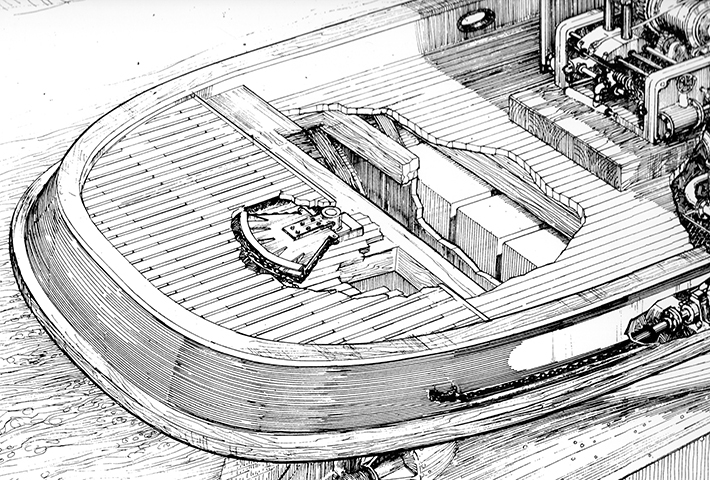 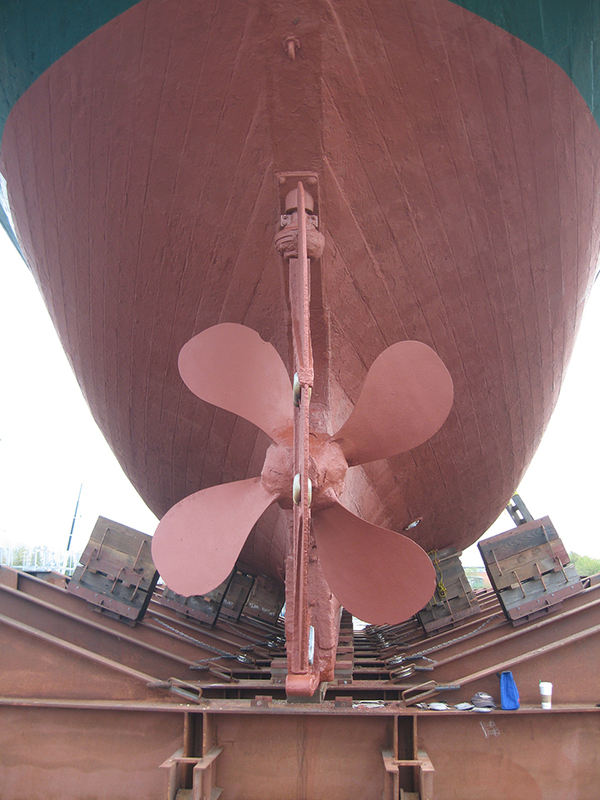 The hull (11) has 3″ outer planks, 8″ ribs and 2″ inner planks. 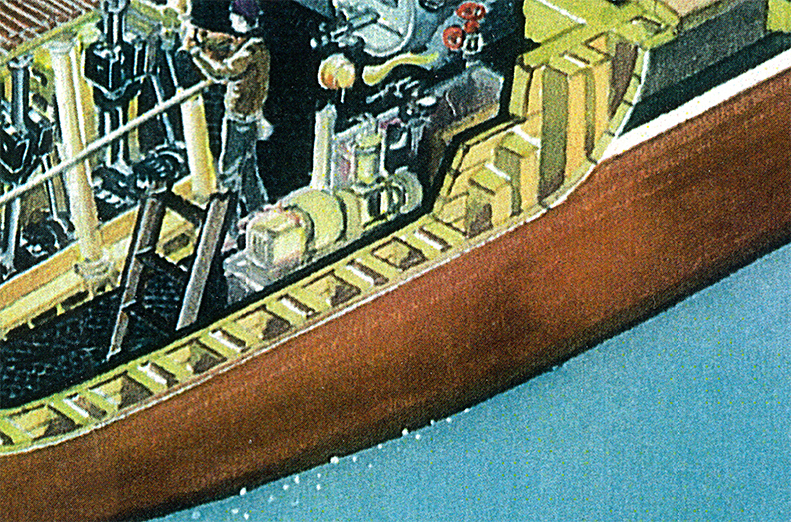 The gap between the inner and outer planks was originally filled with salt. 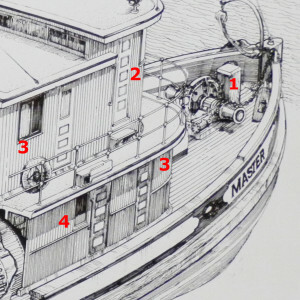 Input from the wheel house is transferred to the steam powered steering engine and rudder quadrant (12) and the rudder (13). 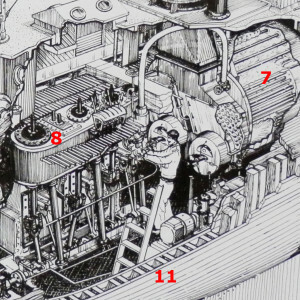 The steam engine’s 330 hp drives an 8′ diameter, 9 pitch propeller (14).